A Tropical Storm called Bertha, which is currently in situated off the east coast of the US, could head towards Europe over the next week – so what’s the outlook? Forecast tracks for Bertha, which was a hurricane but has now been downgraded to a tropical storm, suggest it will head north – staying offshore from the eastern coast of the US before turning to track east across the Atlantic. Forecast track for Bertha from StormTracker shows it heading north off the east coast of the US before turning east. While all forecast models suggest the storm will head in the general direction of UK and continental Europe, there remains a lot of uncertainty about exactly what it will do. One certainty is that as the storm heads north away from the very warm seas which drive its power, it will lose strength and become what’s known as an extra-tropical storm – so we won’t be seeing a ‘hurricane in Europe’, but there is a chance we could see a fairly active summer storm. The development of hurricanes and extra tropical storms can present complexities for meteorologists, and Bertha is a good example of that. Here at the Met Office we use several world-leading forecast models as well as our own, and this gives an indication of how certain a forecast is. If all the models agree, there’s higher certainty, if they diverge, we know the atmosphere is finely balanced and there are several possible outcomes. In the case of Bertha each of the models we use gives a very different picture of what the storm will do. This ranges from Bertha heading towards France as a weak feature which will completely miss the UK, to it arriving as a fairly active summer storm. In terms of timing, there’s also a spread of possibilities – but it looks likely that the earliest Bertha would affect the UK would be on Sunday or into the start of next week. As time progresses, different models normally come more in to line with each other and uncertainty decreases. The Met Office will be keeping an eye on how this situation develops over the next few days to give everyone in the UK the best advice on what Bertha is likely to do. Given the time of year and the potential heavy rain, strong winds and large waves Bertha could bring if it does head to the UK, we’d advise everyone to stay up to date with the latest forecasts and warnings from the Met Office over the next few days. 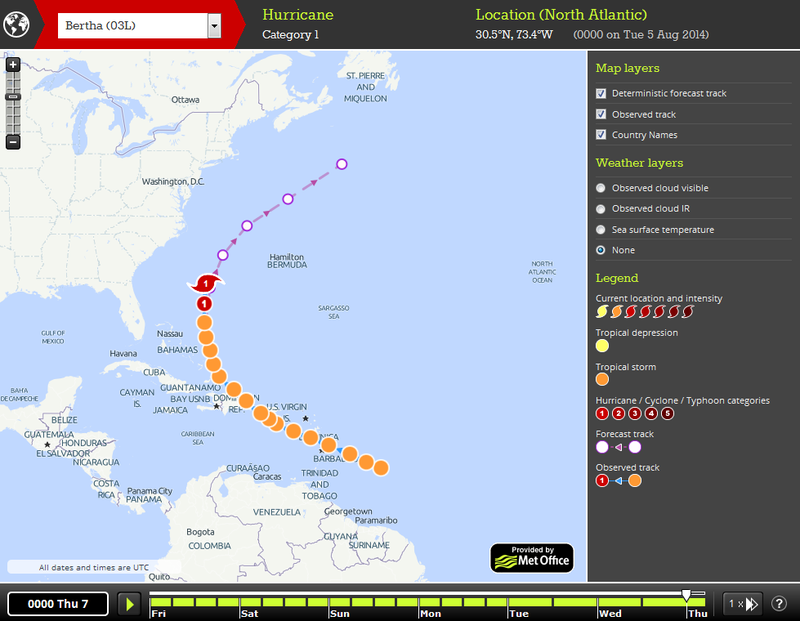 You can also see the forecast track for Bertha and other tropical storms on our StormTracker pages. NOTE – story updated to reflect Bertha’s status after being downgraded to a tropical storm. This entry was posted in Met Office News and tagged bertha, hurricane, Met Office, rain, Storm, summer, tropical storm, UK, waves, weather, weekend, wind. Bookmark the permalink. 6 Responses to Is Tropical Storm Bertha heading for the UK? Been reading my blog again? When I followed the met office’s StormTracker link to track Bertha, Bertha isn’t included on the list of storms – can I track her anywhere else in this way?? This is JUST my luck. Sunshine for weeks yet there am I going camping in Powys Tues to Thursday the week of this bad weather, and intending to swim in rivers (which will possibly by then be raging torrents by the time this weather hits – if it does!). StormTracker uses the advisories from the WMO designated Regional Specialised Meteorological Centres who have responsibility for the issue of tropical cyclone warnings, so when cyclones and hurricanes are downgraded and become extra-tropical these advisories will stop and the storm will no longer appear on storm tracker. You can follow the expected movement of weather systems on our surface pressure charts and forecasts. At the moment it looks like you’ll have a mixture of sunshine and showers next week.